We had the baby shower at my friend's mom's house. It was really nice and alot of fun!! The biggest surprise was that my BFF, Jami, from Houston surprised me. She came up for the weekend, I had no idea!!! It was great to spend some time with her and meant so much that she came for the baby shower!! 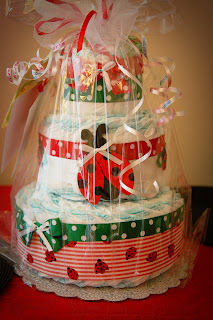 The theme was ladybugs with some Chinese touches. My friend's mom works with a Chinese lady who had just returned from China with authentic Chinese decorations special for the baby shower!! We had Chinese dumplings and fortune cookies. I will post more pictures later, just wanted to give you all a taste!! 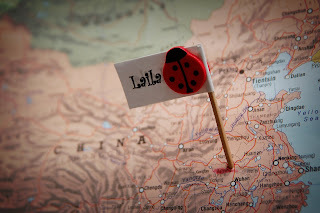 My sister-in-law did a huge map of the world with a little ladybug for Laila in XinYang and with a flower in Denver. 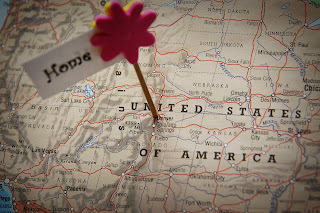 It was very sweet and neat to see how far away we are and yet that's where our daughter is. Jami got us a diaper cake!!! I love it, it's so cute!! 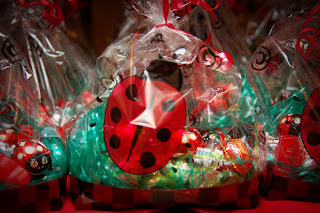 These are the gift bags for people at the shower. 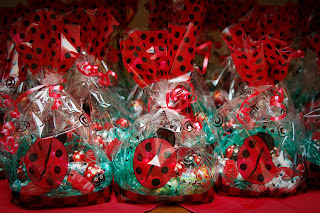 They had little ladybug chocolates, cinnamon bears, chocolate kisses and truffles. Yummy and so cute!! I will post more pictures this weekend of the presents and shower. They are on Scott's e-mail and blogger is acting kinda funny right now. Laila got so much stuff!!! Lots of cute clothes, lots of toys and stuffed animals, lots of bath stuff, food stuff (plates, bowls, spoons, forks), the other car seat, her stroller, high chair, little girl potty chair, toy box, lots of gift cards... books, gosh, so much stuff and we love it all!!! Thank you everyone for all of your gifts, prayers and good wishes!! !